Tired of seeing the same plants in your garden and everywhere else? Feel like changing things up a bit? With this question in mind I’ve turned to my fellow landscape designers to see what plants they are using these days so that every garden they design doesn’t look the same. You can have too much of a good thing. One thing I know for sure is that I don’t want to recommend a plant that hasn’t been shown to be a reliable grower in a variety of conditions. Sometimes the latest and greatest plant introduction turns out to be a dud. Other times a new cultivar of an old favorite hits a home run. Here are some oldies but goodies and new plants to add to your garden. Loropetalum ‘Jazz Hands’ is getting the nod from everyone who’s grown it. If you love the deer tolerance, low maintenance. moderate watering and toughness of regular Chinese Fringe Flower this showy dwarf variety is even easier to grow. Staying low and tidy Jazz Hands Dwarf Pink has cool purple foliage with a cranberry undercurrent and hot pink blooms. It looks great combined with Jazz Hands Dwarf White. Local wholesale nurseries are growing it so it’s readily available. Speaking of local sources for plants, we live in one of the prime growing areas for landscape plants. I recently learned that one of my favorite plants Canyon Snow Pacific coast iris is going through a difficult time. Seems it’s become less vigorous than the other colors in the Canyon series and the growers are working to improve their stock. We need to count on a plant’s performance. There’s enough other issues to deal with in our gardens without starting with a wimpy plant. Rockrose have always been favorites in the low water use garden. 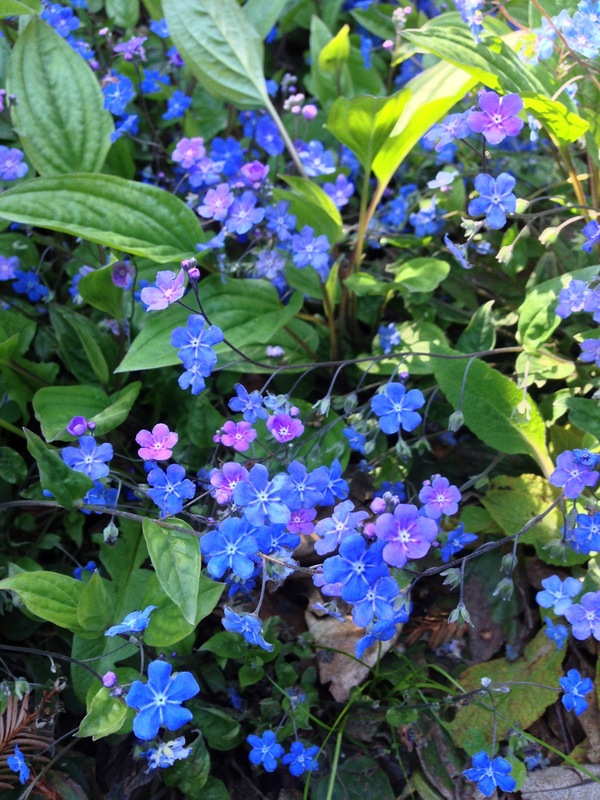 There’s one with a low, mounding habit that hugs the ground and creates a super colorful accent to the sunny garden. With brilliant gold leaves splashed in the center with green this variegated cistus hybridus called ‘Mickie” is hardy in winter, grows only 14-18 inches tall and spreads to about 2 feet wide. Perfect for containers or smaller gardens. If you like to include California native plants in your garden Woolly Blue Curls or trichostema lanatum has been shown to be reliable in the garden if given full sun, good drainage and little fertilizer or amendment. Group similar plants and forget about them. They bloom from late spring through summer and make a good cut flower. Another common name for this plant is Romero or California Rosemary which dates back to the Portola expedition in 1769. If you want to make a big splash in your garden or container try growing Salvia ’Amistad’ or Friendship Sage. With fast growth in the warm months to 4 or 5 feet tall, the rich royal purple flowers attract hummingbirds and butterflies to the garden. It will grow in light shade with medium water requirements and remain evergreen in warmer parts of your garden. 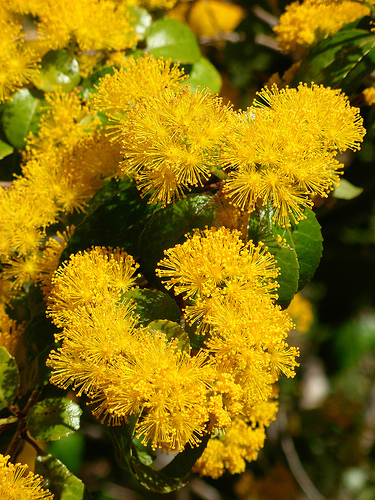 Acacia ‘Cousin Itt’ continues to be a favorite for many of us. This lovely small plant with emerald green, feathery foliage that stays small in the garden and has low water needs. Not to be confused with the bully acacia tree seen around here, it’s one of the good guys. Plant in full sun to partial shade. So if you’re in the mood to add a couple of interesting plants to your garden, take a tip from what landscape designers use or grow in their own gardens. Everybody’s garden looks the best in the spring. Plants are full of new, healthy growth and the heat of summer has not yet descended. Early flowering plants are at there peak and those that wait until summer to flower so that their nectar will attract hummingbirds, butterflies and bees are patiently awaiting their time in the sun. It’s a glorious time in the garden. With this in mind I recently strolled Filoli Garden in Woodside to see what they were doing to conserve water while maintaining all their flower power. I also toured 5 gardens in Palo Alto on the Gamble Garden tour and got lots of ideas for sustainable and beautiful gardens. Filoli Garden is eye candy for any gardener. The estate grounds are maintained to perfection and it was interesting to see what changes they have in store for all those gorgeous, emerald green lawns. The roses, foxglove and peonies were in full bloom, the tulip pots now filled with colorful pansies. Several lawn areas had been reseeded while the large north lawn at the top overlooking the grounds had been allowed to go brown. This is what I learned they have planned to conserve water for the new lawn areas. Filoli is testing turf varieties that might grow well with less water and mowing in the coastal microclimate of Woodside. They have sown or planted twelve species and blends to trial. Each block will have a corresponding sign telling about the variety. The types being trialed include No Mow Fescue Mix, carex pansa, June grass, U.C. Verde buffalo grass, Pacific hair grass and Molate red fescue. Agrostis pallens, blue grama grass and purple needle grass are also included in the trials. 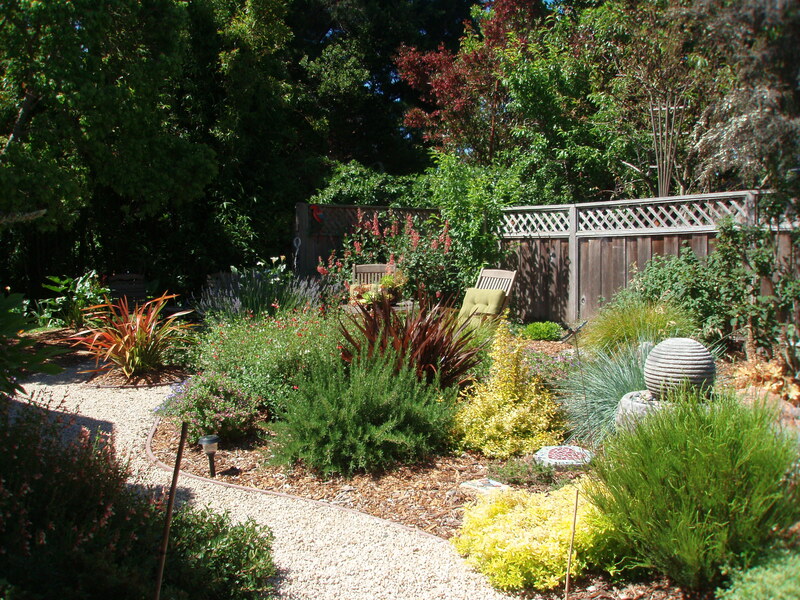 Many of these varieties are among the lawn replacement recommendations from Scotts Valley and San Lorenzo Water Districts. Rethink you lawn this year like Filoli Gardens and get a rebate, too. Next on my spring garden tour agenda were several private gardens showcased on the annual Gamble Garden tour in Palo Alto. Because it’s a walking tour I got as many ideas from the gardens featured as I did passing by the front yards of the other houses. This is the neighborhood where Steve Jobs used to live. I don’t know if his family still does but his orchard on the corner lot is thriving. The theme of this year’s garden tour, Garden are for Living, came through loud and clear in each of the gardens. Many featured sustainable features such as a decomposed granite patio that also serves also as a patanque court, poured in place concrete pavers, corten steel raised bed and path edging and dry laid flagstone paths. Edibles were included in every garden- from a grape-covered pergola to a cleverly designed raised veggie bed complete with steel corners and banding and lighting for evening dinner harvesting. While walking the neighborhood a low water use plant combination of ornamental olive trees underplanted with rosemary and Iceberg roses complemented one Mediterranean style home. Another garden nearby featured a rustic fence made from fallen tree branches. I must have taken a hundred pictures to remind me of all the great design ideas I saw that day. 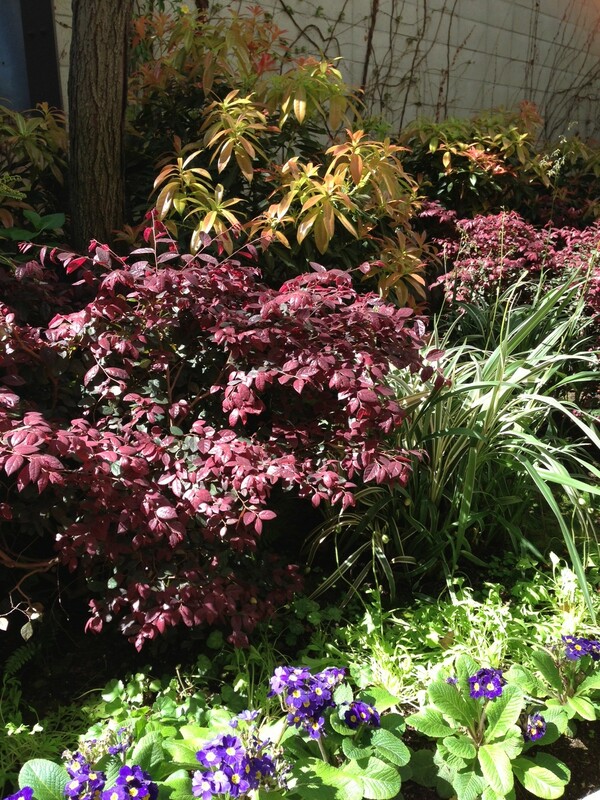 There is nothing like a spring garden tour to get the creative juices flowing. What could be more lovely than spending Christmas Eve at a botanical garden? After a windy, stormy morning the clouds cleared and winter sun brought color to the golden heather, early blooming rhododendron and grevillea growing in the Mendocino Coast Botanical Gardens. I’ve long wanted to visit this famous garden and here was my chance. I was not disappointed at what is described as 47 acres of beauty to the sea. damp earth and the Fern Canyon Creek looked more like a small river. Dogs are welcome here at the Mendocino Coast Botanical Garden so Sherman, our Welsh springer spaniel, was overjoyed with the gardens, too. He seemed to favor the weeping Lebanon cedar and red-twig dogwood but the wild ginger was a big hit also. It’s an easy half mile walk from the perennial garden to the spectacular vista at the ocean’s edge but with so many side gardens and side paths the journey is as long as you want. In the summer and fall the perennial garden is ablaze with blooming plants but even at this time of year there are many specimens that provide foliage color and structure. I especially liked the combination of blue euphorbia paired with Baggeson’s Gold lonicera. This type of lonicera is not the familiar honeysuckle vine but an evergreen shrub called box honeysuckle. It is hardy to cold and requires only moderate irrigation. Other favorite plants in this section of the garden were the blooming hellebore, pheasant tail grass, dwarf conifers, Hinoki cypress and a brilliant purple hopseed. 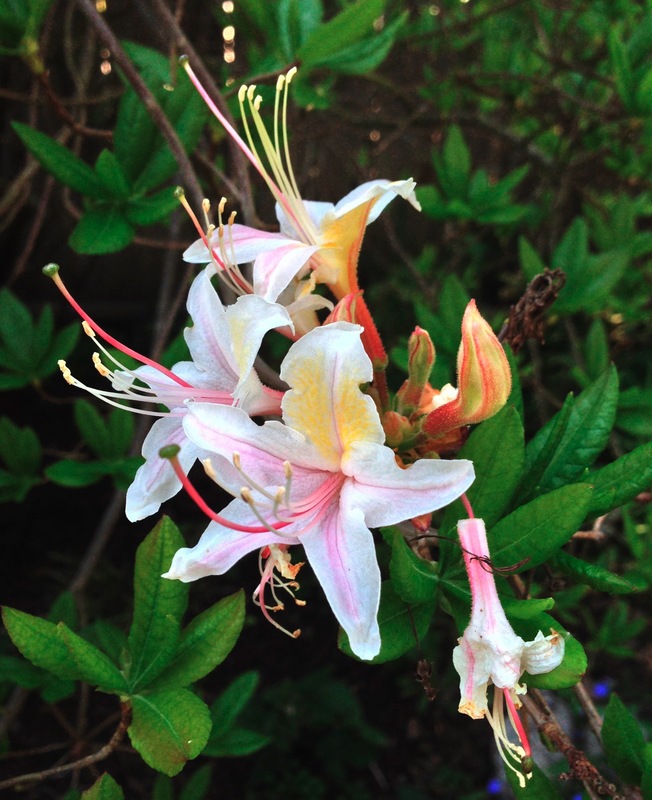 Further down the path, the garden’s signature plant, the rhododendron, made its appearance. Several varieties from the Himalayas including Pink Delight and the fragrant, Harry Tagg, are early bloomers and were covered with blossoms. Many tree-like rhododendrons, including the native rhododendron californicum and the Big Leaf rhododendron will put on their show in late spring. Blooming also in the woodland garden large stands of bergenia cordifolia bordered the path, their bright pink flower spikes surrounded by huge round leaves. Helleborus take any amount of winter weather and the Corsican hellebore at the botanical garden were also in full bloom. I’ve seen huge fuchsia shrubs before but never a fuchsia tree with flaky bark and a few brave fuchsia flowers growing right out of the wood. Fuchsia excorticata is the world’s largest fuchsia and in its native habitat, New Zealand, is can grow to 36 feet tall and form a trunk over a yard in diameter. The flowers are rich in nectar and visited my honey-eating birds there. The dark purple berries, known as konini by Maori, are edible and taste like tamarillos. In New Zealand, possums love this tree fuchsia and have eaten it out of many locations. After passing through an ingenious deer fence gate made from woven tree branches on a wooden frame, the rest of the garden trails wind through pine forest, a fern canyon and a creekside path finally emerging at the Pacific ocean along the Coastal Bluff Trail. This area is open to black-tail deer and native plants like mahonia, salal, wild ginger, huckleberry and Pacific wax myrtle abound. Sherman loved the Mendocino Coast Botanical Gardens as much as I. The gardens are located an on Hwy 1 just south of Ft. Bragg. If you are in the area at any time of year. take a stroll through. You’ll be glad you did. I love my smart phone. I can’t imagine a day without it. A friend of mine told me that I would discover uses that I could only have imagined when I first got it. One of the simple things I use it for is taking pictures. Since I always have it in my back pocket I can whip it out in gardens, nurseries, in the wild or in any landscape that catches my attention. It wasn’t until I started photographing gardens that I realized the importance of combining plants. So now when I design a grouping of plants that look good together I’m thinking of strong foliage plants, colorful flower spikes alongside soft mounds of foliage and delicate flowers alongside bolder blooms. With the first day of fall next week I’m thinking of ways that will have any garden bursting with interest for the next few months. These are strategies for combining plants that are adaptable to all types of garden conditions whether you live in the sun or the shade and will also look good in other seasons of the year. A vignette is a small group of plants that make a pleasing scene because of their complementary and contrasting features. I have several lists of good plant combinations that I regularly refer to when designing a garden. I usually start with a strong foliage plant then add other plants that have interesting texture, form or color. When you look at a garden that you admire it’s usually the dramatic form of one of the plants that draws you in. When you use a plant with a bold, architectural form it makes a statement. 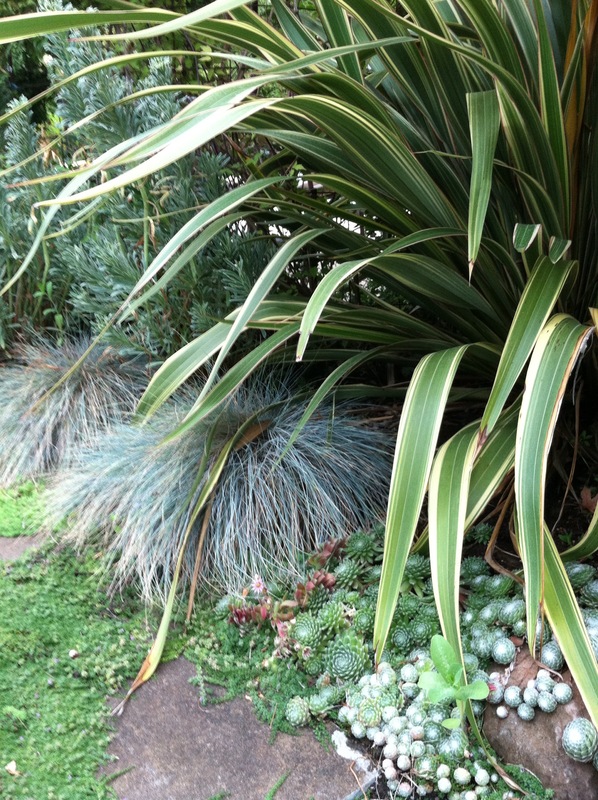 The spiky foliage of Cream Delight phormium alongside a Burgundy loropetalum would make a good combination. Or how about creating a vignette of Festival Burgundy cordyline with Annabelle hydrangea and Cream de Mint pittosporum? During the next few months plants begin to show soft, fall colors. Combine the fading foliage of these plants with plants that complement each other. The reddish fall color or Oakleaf hydrangea along with the pinkish-tan color of their fading flowers looks wonderful when combined with Japanese Forest Grass as it turns pink before winter. Another complementary fall combination is Royal Purple Smoke Tree surrounded by a bed of Autumn Joy sedum. Strong colors sometimes contrast instead of blend when plants change colors in the fall. I like to tone down a combination with silver foliage. An example of this would be a plant grouping of Evening Glow phormium, sedum Autumn Joy and Glacier Blue or Tasmanian Tiger euphorbia. Another way to create a great plant combination is by blending textures. Coral Bark Japanese maple and Plum Passion nandina work well together. Cistus Sunset with Spanish lavender and rosemary is another good combination. I also like a large mass of Blue Oat Grass and Salmon salvia greggii planted together. Santa Barbara daisy goes well with Red Fountain Grass. My list of potential plant combinations is pretty long as I’ve made notes over the years. Each garden has its own personality and growing conditions. A hot, dry garden might depend on a ground cover ceanothus along with lavender while a shadier garden might use natives like heuchera maxima, iris douglasiana, yerba buena and salvia spathacea. Whatever plants you choose, let them work together to make exciting vignettes in your garden. When I visit my best friend’s house I park next to the perennial border that lines her driveway. At any given time of year there is something blooming, flowers filling the air with fragrance and juicy apples hanging on the tree for picking later in the summertime. She has some California natives as well as traditional cottage garden plants all mixed in together. Originally from Illinois, she loves a garden filled with lush green and color but has designed the space with plants that can use less water than you would expect and still look spectacular. What makes for a successful border? You see DIY articles in the gardening magazines showing lovely combinations with rules to follow but they always seem to be for a different climate or location. We often have borrowed scenery from the mixed woods and some of their ideas just don’t work well here. Here are some tips for planting a terrific perennial border in our neck of the woods. Some of the key players in my friends perennial border are natives like Western azalea, hazelnut and flowering currant. These are large, woody shrubs that add height, texture and year round interest. They provide the backbone or structure to the border throughout the seasons and even in the winter. She also has a weeping bottlebrush which is evergreen and provides nectar for the hummingbirds as does the flowering currant. An apple tree and a persimmon tower over all the other plants creating a canopy for the shrubs, herbaceous perennials and groundcovers. 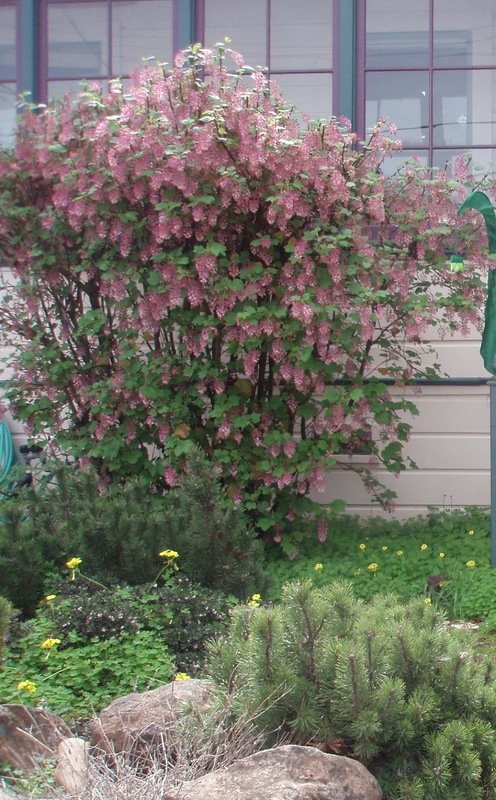 You could also plant spirea, weigela, cornus and viburnums to provide structure to your border. My friend’s border is planted so that there is something of interest every month during the growing season. The persimmon tree is the star of the late fall garden with bright orange fruit that hang like ornaments on the tree. 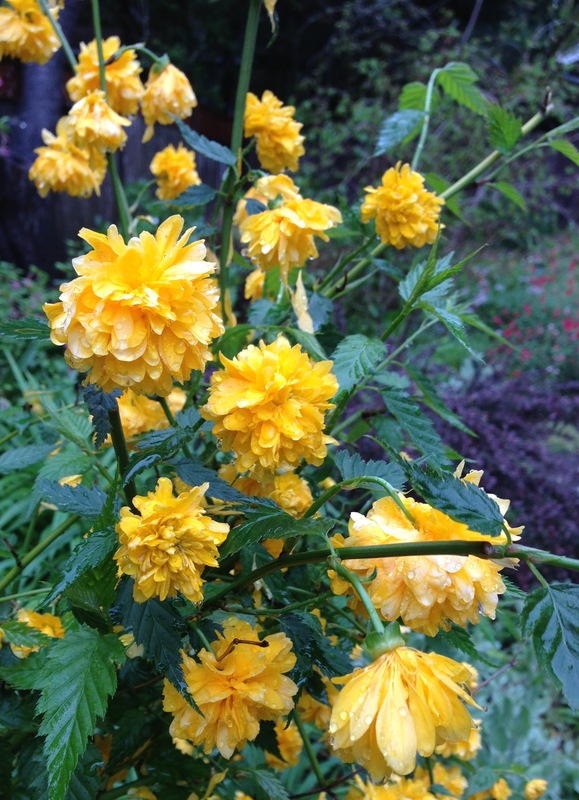 In the spring I can’t take my eyes off the kerria japonica whose graceful shape is covered with double golden, pom pom shaped flowers. The vivid, new foliage of the Rose Glow barberry complements the stand of Pacific coast iris with similar cream and burgundy flowers blooming next to it. Under the bottlebrush a sweep of billbergia nutans or Queen’s Tears is flowering with those exotic looking, drooping flower clusters. They make a great groundcover under the tree and also are long lasting in a vase. Mid-sized filler plants that thrive in this border include Hot Lips salvia, daylilies and polemonium to name just a few. Daffodils and tulips have naturalized throughout the space. Groundcovers grow thickly to shade the soil and prevent precious moisture evaporation. Lamb’s ears like their spot under the flowering currant and the omphalodes have spread throughout the border. This little plant looks and blooms like the forget-me-not but the delicate deep blue flowers don’t produce those sticky seeds that plague both our socks and animal fur. This border get morning sun and mid-afternoon sun until about 3pm. If you have a situation that calls for all sun lovers you could try asters, shasta daisy, grasses, coreopsis, achillea, echinacea, gaillardia, sedum, kniphofia, lavender, liatris and rudbeckia. Perennials that work well to attract butterflies and hummingbirds include monarda and my personal favorite, cardinal flower. Both have long, tubular flowers in bright colors such as red, orange and yellow. it’s easy to have the birds and butterflies coming all season when you plant perennials with overlapping bloom times. Perhaps some of these plant combinations would look great in your garden, too. Just don’t worry too much about the “rules” of perennial borders. Mix it up. You don’t want the border to look like stadium seating. The idea is to have fun and create a border that makes you happy.